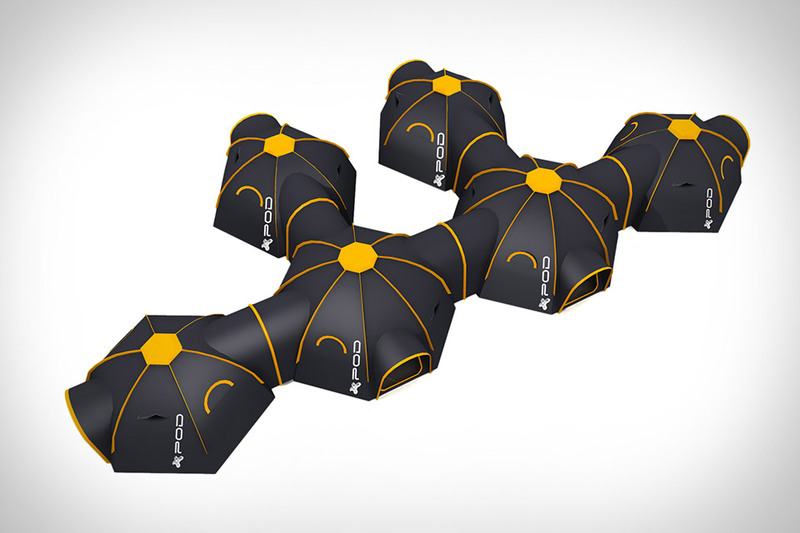 Turn your campsite into an interconnected compound with Pod Tents. These modular tents are available in Mini and Maxi models, with diameters of 3.8 and 5 meters and maximum occupancies of four and eight people, respectively. They're made from ripstop polyester with taped seams, PVC windows, and support poles that are all the same length, making setup a snap. But what makes them special is the ability to interconnect via a series of tunnels, forming a camping community that's as large as you want to make it. Cook and warm up from the comfort of your tent with the Frontier Plus Camp Stove. This versatile, portable wood burner features a large flue that allows the stove to be safely used inside a variety of shelters, including teepees, tents, and even small cabins. The glass window provides a view of the flames, the front-mounted air control lets you easily control the temperature, and the large removable top plate lets you cook with multiple pans at once while still allowing for direct heat when needed. And since the entire thing — including the flue — breaks down and packs away inside the body, it's no hassle to carry it to and from wherever you need it. Using .02 micron medical-grade hollow fibers, the MSR Guardian Water Purifier removes viruses, microbes, contaminants, and other particulates from even the nastiest of water. Its unique design automatically back-flushes 10% of its water with every pump, meaning you never have to manually scrub it, and it's also surprisingly durable, standing up to both freezing environments and drops of up to six feet. It can clean up to 2.5 L of water per minute, and since it's rated for over 10,000 liters before it needs a filter change, it might just be the last filter you ever buy. You make some sacrifices while camping, but don't let those sacrifices include enjoying a great sandwich. This Sandwich Maker from Poler will make campfire dinners way more interesting, giving you the ability to makes melts, grilled cheese sandwiches, or even a new take on a camping staple — the S'more. Just add the ingredients to the cast iron press and place it over an open fire. In fact, these sandwiches might just trump whatever you're making at home as well. You can carry a backpack, and carry a tent. Or you can wear the Moedal & Totem Backpack Tent on your next excursion. Totem, the one-man, three season tent, was designed to work with the Moedal backpack, attaching to its rear side via zipper, and setting up in just 30 seconds. Once it's up, you can detach the backpack to keep your gear with you as explore the wilderness nearby, or use the handy access door on the back to get to your gear without needing to leave the tent. Each set is hand-cut, sewn, and assembled by a 100% blind workforce in Raleigh, NC, giving employment to those who otherwise might not find it. Inspired by the first kayaks, which stretched animal skins over wood, this Kayak from O Six Hundred in Australia brings a 4,000 year old design to our modern culture. Made up of 30 pieces of hoop pine plywood, it's light but incredibly strong, with pieces that snap together quickly and easily. Once the wood skeleton is built, just lace it up with the included translucent carbon fabric for your next glide down a lazy river on a summer afternoon. You don't need to head to an outdoor store to find a trail-ready lighter. Odds are, you already have one in your drawer at home. The Exotac FireSleeve takes any standard-size Bic lighter and turns it into an outdoor-ready piece of kit thanks to a polymer outer shell and cap. The cap keeps it watertight and prevents the gas button from being pressed accidentally, the gas lock lets you keep the lighter going without burning your fingers, and the attachment points keep it close by. And when it starts running low, you can pick up a replacement at the nearest the gas station.